Linda T. Darcy most recently served as the Director of Human Capital Development for the Newington Public Schools in Connecticut. She assumed this position after having worked as the Coordinator of Professional Learning for the Capitol Region Education Council in Hartford. Linda began her career as a teacher of French and Spanish on the secondary level. She has presented at national conferences such as the American Council of Teachers of Foreign Languages, Phi Delta Kappa’s Conference for Future Educators, Learning Forward New England, and the Learning Forward National Conference on the topics of professional learning systems, teacher retention and motivating learners. She is currently studying for her doctorate in educational leadership at the University of Connecticut. Her primary areas of research include culturally relevant pedagogy, teacher retention and urban education. Pet Peeve: Seeing the word ‘respect’ plastered all over a school. You can imagine the shock and confusion on the faces of the gathered educators. “I hate it,” I continue, “because it means different things in different places. And I believe most of the referrals for ‘disrespect’ and ‘insubordination’ are a result of a clash of cultures. This clash can be brought about by anything that separates the teacher from the student . . . it can be age, religion, nationality, economics or race. (It is important to note that people of the same color do not necessarily share the same culture.) Respect is very much a product of culture: family, circumstances, geography, etc. “Respect on Albany Ave. in Hartford looks very different than it does in Farmington, Connecticut.” What is one way to gain respect in a tough neighborhood? Don’t back down. What’s one way to get referred for insubordination in school? Don’t back down. I maintain that incidences of ‘disrespect’ are learning opportunities, and should not automatically pathologized and punished.. This is not to say that all kids get a ‘pass’ on what is considered insubordination. One of our most important tasks as educator is to teach students how to be successful in the dominant culture. However, we can do it without trying to whitewash (pun intentional) or judge how they, their family and their friends live their lives outside of school. Essentially, we need to teach them to code-switch in order to make it in the mainstream. Just as importantly, teachers must to not simply teach the respect we want to see, but model it as well. Most teachers have heard this (or something like it) from a student, “In order to get respect you need to give respect.” In fact, I’m sure many teachers have said this. 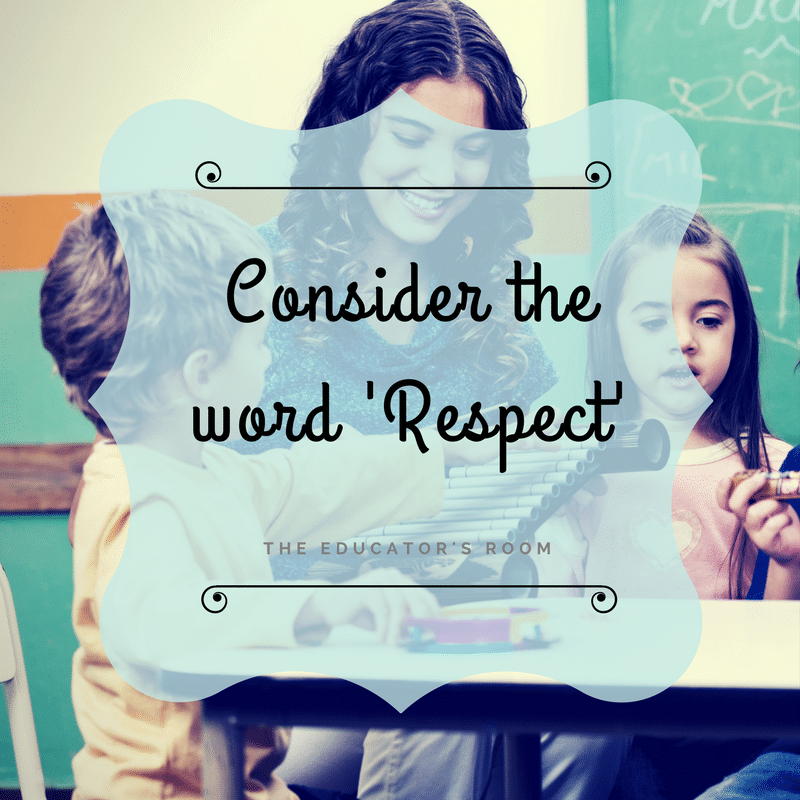 Again, it can lead to confusion in a student who has a different definition of respect. Often, adults do not realize they are committing the very acts they condemn in their students; actions that come across as aggressive. These include raising your voice, hovering over a student while chastising them, reprimanding students in front of other people. If you wouldn’t say it or do it to a drunk in a bar for fear of getting popped, then don’t do it or say it to a child. We need to show and teach our students how to recognize and honor the dignity of other human beings. So what’s the alternative? My substitute for the word ‘respect’ is ‘consideration.’ Merriam-Webster defines consideration as “continuous and careful thought” and the verb to consider as “to think about carefully: such as a) to think of especially with regard to taking some action; b) to take into account. We need to help students build that moment between reacting and responding. I try to teach my students to ‘consider’ the consequences of their actions. I am not only referring to getting themselves in trouble. I am teaching empathy. How do your actions impact the people around you? Bullying isn’t wrong because it is against the rules. It’s wrong because it hurts people. The research shows that punishment doesn’t work to change behavior . . . empathy does. The research also shows that praise doesn’t result in what we would call respectful behavior . . . empathy does. Insisting on ‘respectful’ behavior, without teaching and modeling how the school defines respect, is setting up the student and the student-teacher relationship for a rough road. Thank you for this interesting “opinion” on the word “respect”.